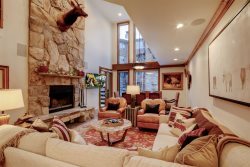 With views of the Deer Valley ski runs, the living room of this 2-bedroom, 2.5 bathroom unit provides a relaxing place to take in the sights of the Silver Lake “beach” where skiers can recline on lounges and bask in the sun on warmer days. This 1496 square foot unit has marble countertops, new appliances, a private hot tub on the deck, a jetted tub and separate shower in the master bathroom, and wood burning fireplaces in the living room and master bedroom. 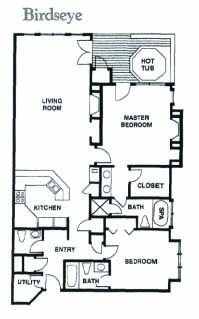 The master bedroom has a king bed and the second bedroom has a queen bed and a twin day bed. There is a TV in the living room and both bedrooms.